Product information "HAIX Black Eagle Safety 52 Mid"
HAIX® knows how hard you work. Reward your feet with the Black Eagle Safety 52 Mid light work boots. This mid length electrical hazard boot wears like a comfortable shoe while protecting your feet like a shield of armor. Women and men alike will find their perfect size. The Black Eagle leather work boots are slip resistant, whatever the surface you are walking on. At 5.5 inches tall and matches-everything black leather, these shoes are sure to be a winner. Made with smooth, waterproof leather on the outside, HAIX® Sun Reflect leather helps keep your footwear looking good and feeling cool. Sun protection treated leather ensures that your feet enjoy a cool, comfortable climate even on the inside. Enjoy the ASTM certified carbon composite toe safety shoes; your toes will thank you if they ever get in a pinch! Also ASTM rated for electrical hazard resistance in its metal free construction. HAIX® Climate System is made for these EMS boots to provide enough airflow through to avoid uncomfortable moisture and sweat. Helps to maintain the natural temperature balance in your footwear which especially important when having to spend long days on your feet. A storage compartment at the front of the boot keeps laces tucked away and out of sight. A clever rear pull tab at the top of the heel helps you pull these shoes on when you need to get going fast. On the inside, the built in arch support of the Black Eagle Safety 52 mid light work boots hug your heels and support your arches to prevent standing fatigue. Pronation support in the mid and insole area keeps your ankles from rolling or twisting away from you. Metal free puncture protection is a standard part of the HAIX® Black Eagle composite toe safety shoes. Designed to be non-marking, the outsole gives you all weather, heel to toe grip and support. Note the tooth like pattern on the outer rubber, made for grip without catching and holding small rocks and other debris. An oil, fuel, and skid resistant rubber/pu outsole keeps you on your toes all day long. The sole on the Black Eagle Safety Boot can be re-treaded as well providing you with many more years of shoe life. Related links to "HAIX Black Eagle Safety 52 Mid"
Customer reviews for "HAIX Black Eagle Safety 52 Mid"
The old adage of you get what you pay for applys with Haix products. I’ve owned similar German brand boots including Haix combat boots. Top quality and long life. No matter what boot you buy the fit will be consistent. Using the same foot model I assume. Does it take a bit long for them to break in? Of course. But proper quality boots take that. In the model here they are not too heavy because of the safety boot features. The soles are great on various terain (snow, dirt, and indoor). As a heavy duty mechanic, the toe cap is great feature for durability. These boots took a bit to break in for me. What I really am not fond of with them is the leather is rather unforgiving in the sense that it doesn't move well with your feet. I find when I am walking down stairs, the material will dig into the upper part of my foot causing pain. I also am unhappy with the traction of the soles. I thought it would be great and I am finding that I am slipping on not only wet floors but since it is winter here, I am slipping on any slick wintery surface. I work in EMS and it is a top priority with me that my boots provide solid traction. I was disappointed these did not. I do not find these boots very comfortable for my feet. They seem to cause more discomfort then I had expected. The shoelaces become loose despite tucking in the laces. I find myself having to retie them a couple of times during my shift. This is just how they fit on my feet and they are made of good quality leather and materials so they might be just fine for other people's feet. I wish I had ordered a different pair of boots since I am definitely not satisfied with my purchase. Thank you for taking the time to provide feedback on the Black Eagle Safety 52 Mid. We apologize that you are not satisfied with your purchase. Our boots do take longer to break-in than normal boots due to the full-grain leather used throughout. That being said, if the leather is digging onto the top of your foot, this could be a sizing issue and the width may need to be adjusted. This may be the major cause of your discomfort. I apologize that the soles of these boots were not as slip-resistant as you were hoping. Many of our other customers rave about the grip support in all weather conditions, I am sorry that you did not share the same experience. Maybe this boot wasn't the best option for you but we hope this will not deter you from considering HAIX again in the future. Stay safe out there! The initial break in period was rough, lasted about 4-5 days, to the point where it made my feet hurt all day. Once I got past it wearing these was a lot better than my last pair of boots. I'm wearing these 5 days a week and no real fatigue at the end of the day. The lightweight nature of these makes it even better, currently considering a second pair of boots to interchange and get twice as much wear out of both. We appreciate your feedback on the Black Eagle Safety 52 Mid. These boots do take a little longer to break in due the the full-grain leather used throughout but we are glad you waited it out and now they are serving you well. We are happy to hear that you are not experiencing any fatigue with these lightweight boots. 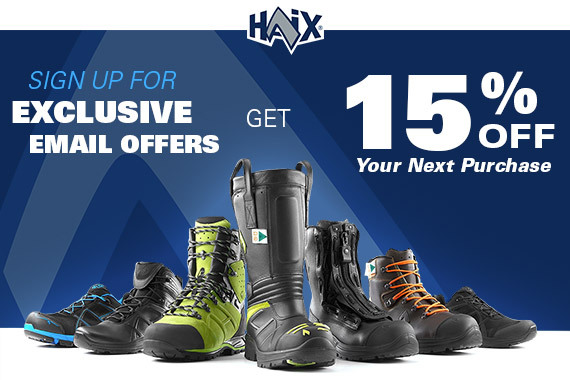 We appreciate your business and your loyalty to the HAIX brand. I'm wearing 12 M- N women shoes, so I ordered a size 9 MED men shoes. Turned out to be some of the best fitting shoes I ever got! They are light, sporty, feel perfect in them, and the composite toe is great both for work and outdoors use. Love the looks, the hiding laces feature and overall the whole design! they are very flexible, and they keep you warm and dry! Highly recommended to all, both men and women! We appreciate you taking the time to give us your feedback on the Black Eagle Safety 52 Mid. We are happy to hear that you have found them to be comfortable, warm, flexible and that they have served you well both on the job and outdoors. Thanks for your recommendation and your support. Great light durable boot! I have used all the other brands and this boot is far superior.